The guys aren't exactly interested in a revival run of the series, but why should that hold Rachel, Monica and Phoebe back? Fans have clamored for a "Friends" revival ever since the beloved sitcom came to an end back in 2004, but as the years go by, it seems less and less likely to happen. After all, half of the stars from the ensemble cast have made it clear that they just aren't interested in revisiting their old roles — the male half, in particular. But now there's reason for renewed hope, thanks to Jennifer Aniston and her perfect plan for a girls-only reboot. Just days after Netflix made headlines for reportedly paying "around $100 million" to keep "Friends" on the streaming network for one more year, Aniston paid a visit "The Late Late Show" and pitched her golden idea. "The girls always say we would love to do it again," she began. "The boys are a little less excited about it for some reason." The solution? "We've decided that we'll just do like — and I've said this before — a remake of the 'Golden Girls' in 40 years." And while that might require relocating from a swanky New York apartment with a balcony to a Miami rental house with a lanai, little else would have to change. "Which would you play?" host James Corden wondered. 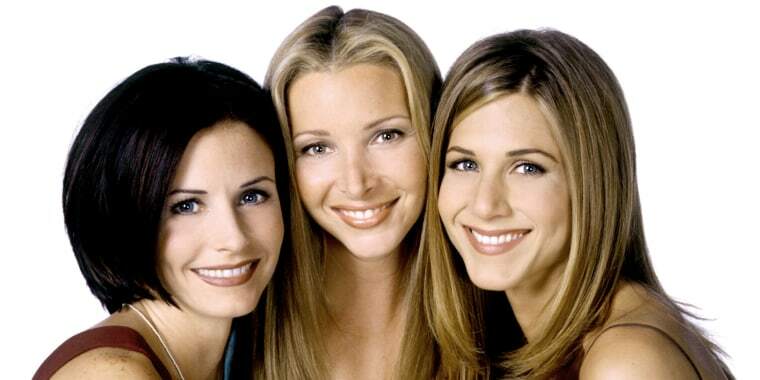 After giving it some thought (and giving the Rose role some serious consideration), Aniston said, "What if we're Rachel, Phoebe and Monica as just 'Golden Girls'?" Well, that would certainly have fans singing, "Thank you for being a 'Friend' — again!" All of that may sound like some far-fetched small-screen fantasy, but it's important to note that Aniston has given this idea plenty of thought. In fact, she brought it up in an August interview with InStyle magazine, wherein she imagined Rachel, Pheobe and Monica kicking back and spending their "last years together on wicker furniture." As long as that wicker furniture isn't at Shady Pines, it sounds like a fitting final chapter for the ladies.